Wash & chop the tomatoes in large chunks. Remove pits from the dates and chop them in halves or in thin slices. Heat oil in a pan, add mustard seeds, when they crackle, add fennel seeds, fenugreek seeds, cinnamon & dry red chillies. Add the tomatoes, grated ginger, turmeric powder, salt and stir. Cover and cook on low heat till the tomatoes are cooked. Every minute or so, remove the lid and give a good stir. Once the tomatoes are cooked, add jaggery, raisins and dates and cook it for another 5 minutes till the jaggery has dissolved and you get a thick consistency. Serve it warm or cold. 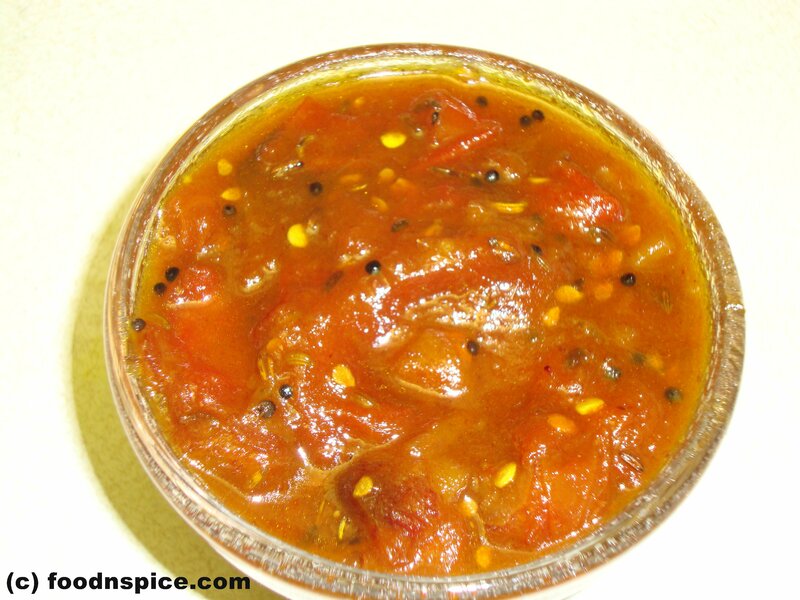 This chutney can be stored refrigerated for up to a week.